Who Will Go In Episode Three ? Did Jessie Camacho Deserve To Go ? Check out some of the great priced goods below or check out our Survivor Store. In looking at preview clips for Episode Three as well as the summary on the official website it appears there will be a great deal happening within each of the tribes. I think what's on everyone's mind is who Silas Gaither, the 23 year old Bartender from Texas will align with in voting at Tribal Council. It seems that from his discussion with Lindsey Richter that he wants to vote Frank off but is this going to happen? Most people in Silas case would probably align with the older alliance consisting of Teresa Cooper, Linda Spencer, Frank Garrison and Carl Bilancione who seem to be a much more mature and straightforward group. If not he can align with the younger group consisting of Brandon Quinton, Kim Powers and Lindsey Richter but as indecisive as the younger generation go he will probably align with the older generation. 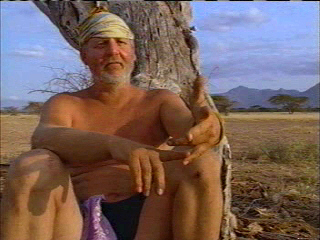 But still there is the issue of who in the Samburu Tribe will be voted out if they do lose the immunity challenge. There really is only four people who can be voted out. They are Frank Garrison, Brandon Quinton, Kim Powers or Lindsey Richter. The younger Samburu group only want to vote Frank Garrison out and the older group would be quite happy voting any of the three young tribe members. From the discussion between Silas and Frank it appears that they want to vote out Lindsey as she is getting on everyone nerves but the worst scenario for them happened (much to the delight of Mark Burnett and CBS) Lindsey overheard what was being said and was upset with their decision. I think Silas will convince the tribe to keep Lindsey as there is a bit of chemistry between them which leaves Brandon and Kim Powers to have their torches extinguished. Brandon seems to be the weakest link for their tribe and could be an easy target at the Tribal Council. The Boran Tribe is a lot easier to work out. It seems Lex and Tom have formed their own alliance and have included Ethan to be a strong majority. That leaves Kim Johnson, Kelly and Clarence. Clarence has always seemed to be the obvious target but his strength necessary in winning the challenge will be necessary and he will make it past another tribal council. It looks like Kelly and Kim are the obvious choices for ejection at Tribal Council. Kim seems to be a lot weaker than Kelly as we saw in the Reward Challenge and again looks like the main Target. If these three wanted to go far then Clarence, Kim and Kelly should form their own alliance - only time will tell. There is also a problem with one tribe member becoming weak and dehydrated and it appears to be Lindsey Richter from the Samburu Tribe. But Mark Burnett could make it appear to be her and could in fact be someone else. He dumbfounded us last episode when by the surprise of the whole nation we watched Jessie Camacho be eliminated from Survivor. Since the commencement of the second series set in Australia I have never listened to any supposed "factual" information Mark Burnett the Executive Producer has said. But if in fact Lindsey does leave due to her illness it is definite that Brandon and Kim Powers will be the next two voted out of the Boran Tribe.